In “The Hobbit: The Desolation of Smaug,” which takes place right after the events of the first film “An Unexpected Journey,” Bilbo Baggins, Gandalf and 13 dwarves led by Thorin Oakenshield travel to Erebor to reclaim their kingdom from Smaug. The new trailer for “The Hobbit: The Desolation of Smaug” was released today and even though it runs just two and a half minutes, it provides us with a lot of detail and gives us a glimpse of Benedict Cumberbatch’s chilling motion-capture performance as the titular dragon Smaug. Legolas, as played by Orlando Bloom in “The Lord of Rings,” is shown as possibly having a relationship with newly-created character Tauriel (Evangeline Lilly). We also get our first look at Bard the Bowman (Luke Evans) in a scene with Thorin. If you watch the trailer from 1:00-1:09, you see some hints at the main storyline of “The Lord of The Rings” with a glimpse of the Sauron Eye. Warner Bros has released a fantastic thriller for this film, while providing us a brief glimpse of Smaug. We still do not have the whole picture, but Smaug saying, “Come now. Don’t be shy. Step into the light” in Cumberbatch’s low rattling voice has me excited to see this movie. 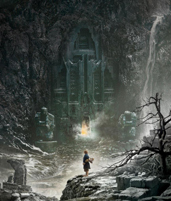 “The Hobbit: The Desolation of Smaug” will set sail on Dec. 13 in 2-D, High Frame Rate 3-D, other 3-D formats and IMAX.